University of Sunderland lecturer Naomi Austin will return to her roots this weekend for a book signing after a summer of adventure. The senior lecturer in Fashion will be at Waterstones in Newcastle to sign copies of her new book, The Call of the Sea, which has won national praise. Complete with foreword from architect, TV presenter and University of Sunderland honorary graduate George Clarke, the coffee-table book is a stunning 288 pages of digital images, shipbuilding testimonials and beautiful photographs centered on the Tall Ships Races and Sunderland’s maritime history. 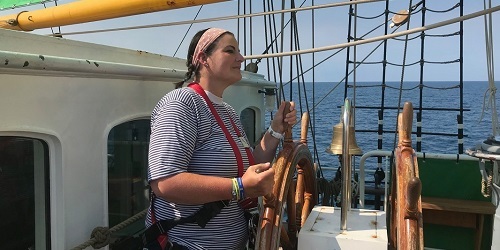 This summer Naomi played a key role in the famous races, working as a volunteer while the spectacle docked in Sunderland, before travelling on board the German ship Alexander Von Humboldt II, during the race itself. Naomi’s love affair with the event started way back in the summer of 1993 when she won a competition to travel onboard the Sir Winston Churchill Tall Ship after the races came to Newcastle. It was that visit that sparked the flame that would go on to see her create The Call of the Sea. Throughout August, some of the digital drawings which featured in the book were exhibited at Arts Centre Washington. The book itself has been nominated for The Mountbatten Award for Best Book. Naomi will be at Waterstones in her home city of Newcastle to sign copies of her book on Saturday 15 September from 12pm.